Business and First Class Passengers already have an advantage getting through airport security because of priority access. 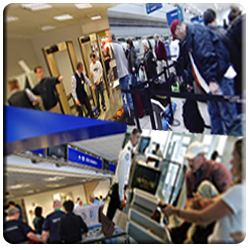 Other programs such as the TSA precheck or Global Entry Programs can also speed up wait times through security and immigration check points. Here are some other useful tips to help reduce your wait time and to get you through the security checkpoint process as quickly as possible.